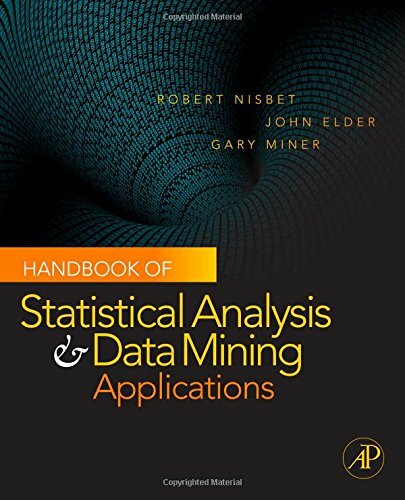 [PDF] Handbook of Statistical Analysis and Data Mining Applications | Free eBooks Download - EBOOKEE! Description: Data mining practitioners, here is your bible, the complete "driver's manual" for data mining. From starting the engine to handling the curves, this book covers the gamut of data mining techniques - including predictive analytics and text mining - illustrating how to achieve maximal value across business, scientific, engineering and medical applications. What are the best practices through each phase of a data mining project? How can you avoid the most treacherous pitfalls? The answers are in here. Going beyond its responsibility as a reference book, this resource also provides detailed tutorials with step-by-step instructions to drive established data mining software tools across real world applications. This way, newcomers start their engines immediately and experience hands-on success. If you want to roll-up your sleeves and execute on predictive analytics, this is your definite, go-to resource. To put it lightly, if this book isn't on your shelf, you're not a data miner. No comments for "[PDF] Handbook of Statistical Analysis and Data Mining Applications".